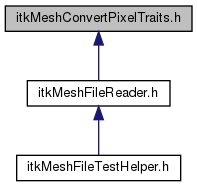 Definition at line 72 of file itkMeshConvertPixelTraits.h. Definition at line 351 of file itkMeshConvertPixelTraits.h. Definition at line 380 of file itkMeshConvertPixelTraits.h. Definition at line 305 of file itkMeshConvertPixelTraits.h. Definition at line 160 of file itkMeshConvertPixelTraits.h. Definition at line 195 of file itkMeshConvertPixelTraits.h. Definition at line 203 of file itkMeshConvertPixelTraits.h. Definition at line 231 of file itkMeshConvertPixelTraits.h. Definition at line 269 of file itkMeshConvertPixelTraits.h. Definition at line 277 of file itkMeshConvertPixelTraits.h. Definition at line 119 of file itkMeshConvertPixelTraits.h.